It has been more than a month since I posted anything here even though I cooked a lot of things and took photographs too but there were so many things which kept me away from writing for my blogs. All those things can wait but I must tell you all that I kept visiting all the wonderful blogs and discovered some more wonderful blogs. One of them is by Ushnish Ghosh where I found so many interesting things. This recipe was there with a cute story behind it and I decided to make the fish immediately after reading it. It has happened for the first time that I am so quick in trying out a recipe. He had used large cubical pieces of cheetal fish but I had only 3 large steaks left in the freezer, of a huge rohu we brought and made many delicacies in the last fortnight (recipes of patraani macchhi and sarson wali machhli is coming soon). I got going immediately after commenting on his blog and was thinking it might well be a torture for Arvind who cannot tolerate much red chilli and thinking ki aaj to baarah bajne waale hai mere (he would complaint). The recipe was quick as I had expected AND Arvind was eating it faster than me to my utter surprise, note that I am supposed to be the big mirchi lover. But tables turn sometimes. This recipe can well be taken as achaari machhli by north Indians especially punjabis and you can be tempted to add lemon juice or amchoor to it. You'd love the way it is, without the sourness too it can be called achaari machhli as it has the aroma and spiciness of a pickle. Rub the fish pieces with salt and turmeric powder and let them rest for a while, mine were lying this way into the freezer already. I used a light dusting of besan over the pieces to fry to prevent it from sticking to the kadai I was using. If using less oil for frying in a metal kadai the fish sticks and breaks, so besan or atta helps. Also make a slurry of turmeric powder and chilly powder with 3/4 cup of water and keep aside for about 10 minutes. Heat 1 tbsp oil and fry the fish lightly and keep aside..
Now add the nigella seeds to the remaining oil, let splutter and pour in the chilli turmeric slurry directly into the oil. It might make you sneeze so keep your face away from the pan. Let it boil for a minute and slip in the fried pieces and cook for another minute coating it well with the watery liquid.. Add the 1/2 tsp mustard oil which I have mentioned in the ingredient list separately. It gives a nice mustard taste which is like by bengalis and UP people, you can add some more water during cooking but it should just coat the fish and not be runny. It's ready to savor the taste, we had it with chapattis though any self respecting bengali will shudder at the thought of having it this way. This mirchi wali machhli can be enjoyed whatever way you like but roti or paratha will help you mop the sauce well as you wont want to miss those bits of this dish. It is not a fish fry but can become a fry if you dry it completely. We like it a bit saucy, the sauce actually is quite delicious. Welcome back. I can not tell you how much I love fried fish and how much I crave it since we don't get good desi fishes out here. I love the marinade you have used/adapted. Will surely try to use it for chicken or maybe paneer. Sangeeta, Good to see that you are back to blogging.I am not the right person to comment on the fish preparation..being a veggie, I am here only to say, keep blogging dear. Forgot to write before, your pictures look good. Did you get a new camera? Pic makes me tempting, looks so yummy. 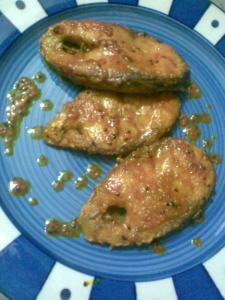 fish looks yummy an spicy ya i am from delhi ,,:-)wish u happy diwali,.. I am honored!! To be very frank, I was judgmental that seeing my blog and the red color of the dish, no one will try....so I am withdrawing my judgement on this. I will try your variation as it is a 10 min recipe. May be to increase the gravy, and red color, use less hot chili powder, deghi mirch ( Kashmiri ones)as much as you want..it wont be hot..red chili is good for health too. Well if you want to get that achari flavor, add few seeds of Methi, SauNf , azwain along with nigela ( OK, OK I know that you know). as soon as my wife arrives from her clinic, I will make her read your blog, I am not that " Bad for every thing"
thanks all of you...for having it with rotis...well we can eat anything n everything with roti....multigrain mostly. Jaya ...thanks for the compliment on pics...it's my same old cell phone cam...i suppose maine jyada pyaar se khana banaya tha..
happy Deepawali to all of you. OK accepted I will reserve the Punjabi achari mashala for the appropriate dish.